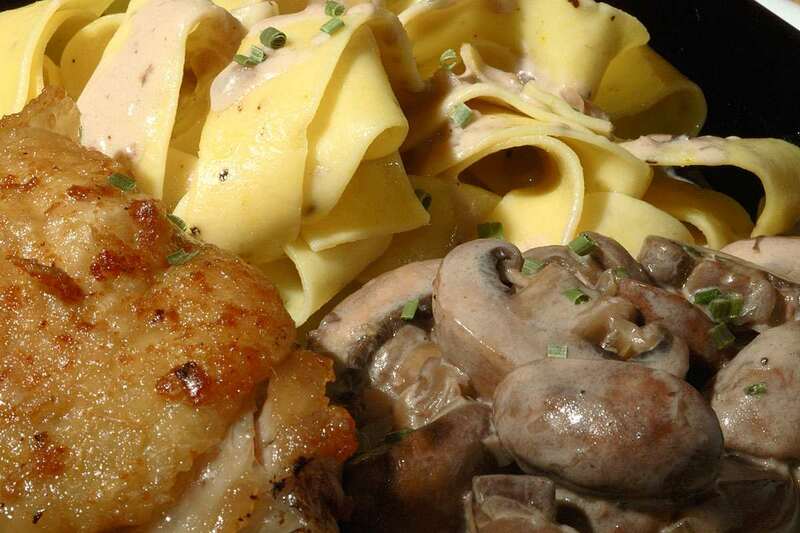 Pan-fried chicken thighs with crimini mushrooms in a simple Marsala and cream sauce. Simple and easy to cook but elegant and flavorful. Set heavy saute pan over high heat, add olive oil and brown chicken thighs from all sides, starting with the skin. Reduce heat to medium and cook until chicken is fully cooked (ca. 20-30 minutes). Turn occasionally. Season with salt and pepper, set aside and keep warm. Remove excess fat from pan. Cook onions until soft and translucent. Add garlic, cook for a minute. Add mushrooms, cook for ca. 10 minutes. Do not cover. Add Marsala, salt and pepper, then cook until liquid has almost evaporated. Reduce heat to low and stir in sour cream and chives. Adjust seasoning with salt and pepper. Serve chicken and mushrooms with pasta, sprinkle with chives.